John Carmack has been touting Megatexturing as the most important features of his Id Tech 5 Game Engine. Though the Technology itself is impressive, in effect allowing very very large textures to be used without memory constraints (as the texture is streamed), and making it possible to use Unique detail anywhere on any size mesh, it has the major drawback of using phenomenal amount of Texture data for even one level. 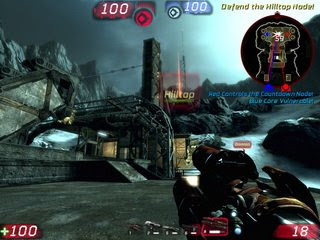 A game like Unreal Tournament 3 which has lots of various levels(but textures can be shared between levels and meshes too, and it is done also), and is also good for expansion by mod quantity(You can get lots of High Quality Maps for both Unreal Tournament 3 or Quake 3). Making a new map is hassle free can be made very small in size(use maximum UT3 supplied textures, and pack only your own added ones), and easy to distribute, add and use. Compare this with Enemy Territory Quake Wars(Maps by mod community? where are they?). Each of ETQW’s level has a megatexture(.mega file) with size of 400-500 mb which can be opened in specific toolset of id software only. Even if you use the same ground and grass, you have to repack your megatexture at size of 500 mb extra. And as one goes adding levels only 50 levels will mean some 25 GB Extra space + 4.5 GB of original making it 30 GB, where as with (UT3 + nvidia PhysX pack + UT3 Titan pack) some 60 maps of UT3 take only 12 GB space. And adding a new map doesnot mean 500 mb it can be even done within 50 mb, which is not possible with ETQW. Thus megatexturing makes modding and expansion of content with new maps extremely ridiculous which is a strong point of such games. One can very well contemplate the texture usage of a Jedi Academy like game(27 levels) made with id Tech 4. It goes far much higher with id Tech 5, for a game like RAGE which is rumored to be released on 4 DL or 8.5 GB Discs making it almost above 30 GB and that too when compressed. But the Content is just two big areas and environments till now seem pretty closed and not 360 degree open like Oblivion. Just imagine the hard disk requirements for Oblivion like game in Oblivion like Visual fidelity and very large environment. It is almost difficult to travel all the world of Oblivion from one end to other on foot in one playthrough and you can also go on foot. And all this take only 5 GB. In Oblivion Meshes and Textures are cleverly reused and it looks pretty impressive. The point I am trying to make is Megatexturing does not bring a great graphical difference, actually if you look attentively and knowing beforehand then only you can notice the Unique texture on terrain in ETQW, it does effect on Subconscious level, but the price for such minor difference is very big. Real Time radiosity makes far much greater difference in Visual fidelity for that matter. Even Pre – Computed Radiosty of Half-Life 2 was very real looking, providing a great hint to subconscious mind for realism in lighting. And Crysis just looks 3 times better then Enemy Territory Quake Wars(which itself is very good looking but the lighting is static) and Half – Life 2(Static Lighting), but the lighting effects in Crysis are fully Dynamic and still very realistic(Ambient Occlusion is used if you are wondering which is a bit less real than Radiosity, but can be done in realtime these days). And Even Screenshots of RAGE look inferior to Crysis screenshots of 2007 and RAGE is still not released. 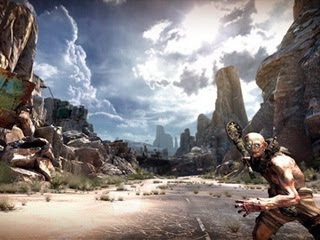 Though I agree that if you look closely, texures in RAGE have Unique detail, which might look more clear on Grand Canyon(RAGe Environments) but will be definetly lost in Crysis like Islands, Jungles, COD MW like Urban, UT3 like Sci Fi environments. 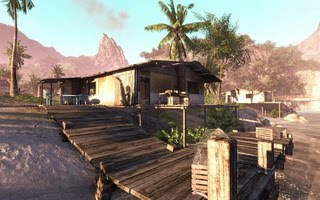 Crysis itself has a Grand Canyon or Black Mesa like map in Multiplayer which looks great to me. 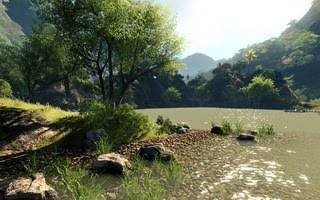 I am not a Crysis fanboy or infected with Crysis Influenza but when you look at Crysis technically and graphically it seems to remain unchallenged for next 3 years from now, (though in 2007 it was surmised that it will be so for next 3 years but we are already in 2010 and no new game looks better than Crysis). ARMA 2 has bigger environments but it does not look better than Crysis and kills the performance. Oblivion has possibly the biggest world in a single – Player game(A level of FarCry can also be noted as the biggest level that didnot needed any loading in between and that too without streaming) and looks far better than ARMA 2 due to quality artwork, and runs very efficiently. Also Crysis also has great performance on High setting on 600$ PC, at which it looks far better than Ultra of any game that is to be released these days. I may also point out that id Software has always outperformed itself and others, so we may wait and watch, but then Valve has always put a great game after major id release which has blown them. Half – Life after Quake, Half – Life 2 after Doom3 and the difference was very big both in graphics and gameplay. Recently Crytek is busy blasting everybody with there top quality games like FarCry(which had different but boring gameplay) and Crysis(which has great gameplay but flounders in last 4 levels of aliens), Crysis Warhead(which also has some boring alien levels and falls a lot short of spectacular Call of Duty MW1 , MW2 gameplay). Gamepalywise is a subjective issue and this post is about graphics technology. 1 – I give Cry Engine most points as best technology for creating next gen great games, development is also super smooth due to all development being done in real time and now that it runs great on PS3 and XBox360 also and looks Ultimate cool. Only this Engine supports true great quality Dynamic lighting and Dynamic Time of Day. 2 – Next is Unreal Engine 3 as it is tested, efficient, easy, featureful technology and has proved itself countless times. It also support maximum platform including Linux. 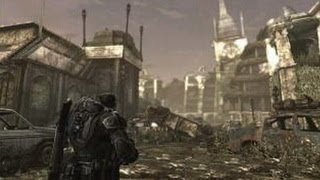 3 – Next is Valve source Engine, If one really wants to make a gmae which can run on majority of PC’s and XBox 360, and Source Engine has proven track record of delivering highly interactive games. But I warn it has not well organised or clean code-base. 4 – Next is id Tech 5 being the last one available, which I do not recommend at all, due to not having any qualities mentioned above, and it still burns Lightmaps in its Giant Textures, foregoing full world Dynamic lighting, no Dynamic Time of Day. There are lot more other Engines like Dunia Engine of FarCry 2 which may dazzle a bit but falls short in many departments so I strongly advise against using any other engine then top 3 I mentioned.